There's a bit of a steam punk revolution going on in Brian Carlisle's "junky garage". 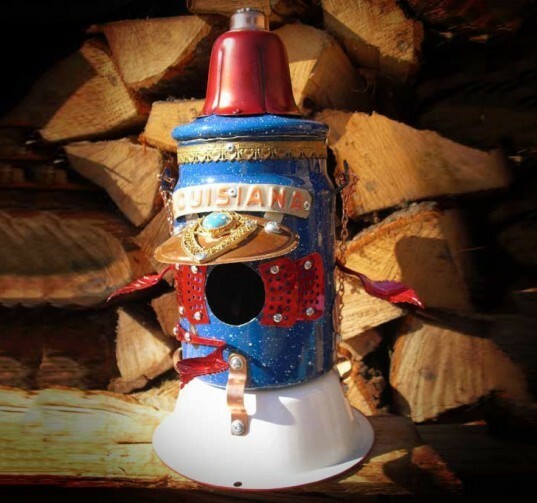 The crafty fellow has made an art out of turning unwanted wares and scrap metal into beautiful birdhouses with an antique charm. Carlisle was inspired by the birds that visit his yard, and he eventually started to feed, photograph and tend to them - he even had his yard certified as a wildlife habitat with the National Wildlife Federation. But he didn't stop there - Carlisle, who is a freelance graphic designer by day, decided to give these visiting birds a place to rest, and started creating the spectacular birdhouses for his backyard. To date, he's managed to turn his fun side hobby into a small online business. Carlisle spends his spare time digging through flea markets, thrift shops, and antique stores, or sifting through items given to him by family and friends for his materials. Items used in his designs include everything from percolators to flour sifters to trophies, and he’s even managed to work in a discarded metal space heater! His birdhouses are a careful assemblage of numerous pieces of various origins, which eventually all come together to create a single structure worthy of any avian flock. You can see more of the Carlisle’s creations – which are not just limited to birdhouses – on his website here. And if you’re interested in purchasing one of these whimsical pieces for yourself, hit up Carlisle’s Etsy shop for some ready-to-go designs! Looks like you've upcycled a jam jar for your camera lens!? Thanks for the great feature! I hope and encourage everyone out there to find your niche to help the environment and all creatures great and small. Carlisle spends his spare time digging through flea markets, thrift shops, and antique stores, or sifting through items given to him by family and friends for his materials. 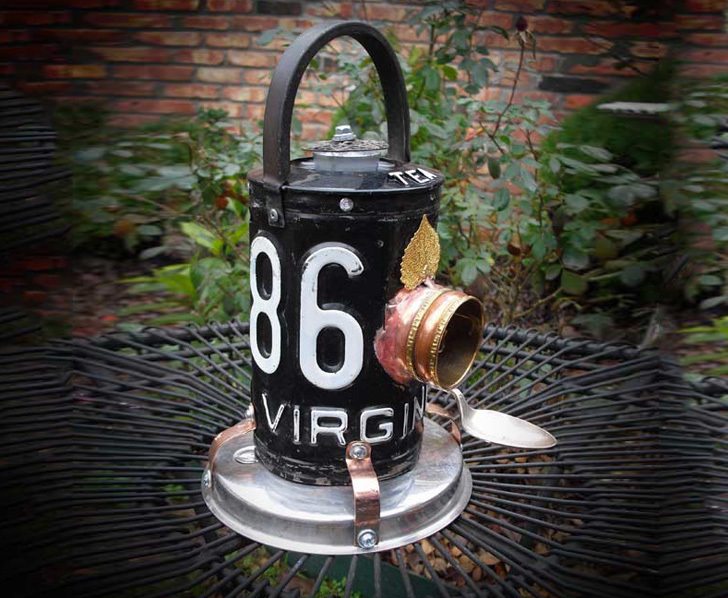 Items used in his designs include everything from percolators to flour sifters to trophies, and he's even managed to work in a discarded metal space heater! His birdhouses are a careful assemblage of numerous pieces from various origins, which come together to create a single structure worthy of a visit from any avian flock. The whimsical designs add a bit of flavor to any backyard. Because they are primarily made of metal, Carlisle warns users to keep the houses out of direct sunlight due to over heating. You can see more of the Carlisle's creations - which are not just limited to birdhouses - on his website here. And if you're interested in purchasing one of these whimsical pieces for yourself, hit up Carlisle's Etsy shop for some ready-to-go designs!